How many of you have had your heart broken? How many of you had a friend betray you? What about having someone you thought was your friend, secretly plotting against you? In life, we are faced with situations and people who try us in more ways than one. People will use, abuse, mistreat, and do all sorts of things to piss you off. As human beings, it is natural for us to feel hatred, and animosity towards people that do us wrong. We may even give them the old fashioned silent treatment. I have had my share of experiences, where I have had to learn how to forgive. People that I thought were close to me proved to be “snakes” as I call them. Now for a minute, I held a bit of animosity towards these people. I thought that ignoring or giving the silent treatment was the answer. After a while I realized that it just was not worth it. It’s like the Lord was talking to me, teaching me how to forgive. I then begin to slowly start to accept the fact that in life, God will put people in our life as lessons. One of those lessons is the act of forgiveness. 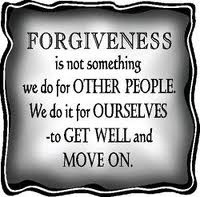 Forgiveness will help you get through life, and feel better about yourself when going through situations. If Jesus can forgive us for all of our many sins, why can’t we forgive our neighbors? Think about it….